Today we embark on our life-changing experience as we begin our journey to the lands of ancient treasures and Christian history with an overnight flight to Greece. Meals and Beverages are served in flight. As we arrive at the airport we are met by our friendly Pathfinders representative who escorts us to our motor coach. After checking in to our hotel, we enjoy a tour of Thessaloniki, a city that is over 2,300 years old. It was here that Paul wrote his letter to the Thessalonians. Enjoy an evening at leisure and dinner on your own. Overnight in Thessaloniki. Today we drive to Philippi, where Paul delivered his first sermon in Europe, sowing the seeds of Christianity (Acts 16:12-18). It was here that Paul baptized a certain woman named Lydia, the first Christian convert in Europe. We visit the Roman forum and the prison where St. Paul and Silas were thrown before gathering at the Roman Theater for prayer and teaching. 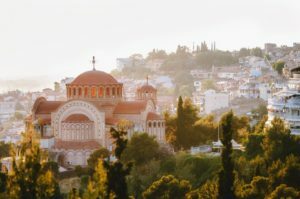 We continue into the modern port city of Kavala, and visit the ancient Neapolis, where Paul, accompanied by Silas, Luke and Timothy, first set foot in Europe. This ancient city was later renamed Christoupolis because it was the first European city to accept Christianity. Dinner and overnight in Thessaloniki. We begin our day by exploring Thessaloniki, the Roman Market, theater and baths. Our teaching today takes place at the theater of Agora, the place Paul visited often. We make our way to the Arch of Galerius, the City walls, Chain Tower and Citadel. From here we visit the White Tower, Byzantine churches, the cave and well of the Apostle Paul, Monastery of Vlattadon. We then take some time to gather right at the stairs of the walls overlooking Thessaloniki . We continue to Jason’s home, Aristotle’s Square and statue of Alexander the Great. Finally we visit Berea where Paul established a small church and visit the reconstructed steps of the bema (or rostrum) and see the newly placed mosaics of Paul and the plaque of scripture regarding the “more noble” church. We make our way to Athens for dinner and overnight. 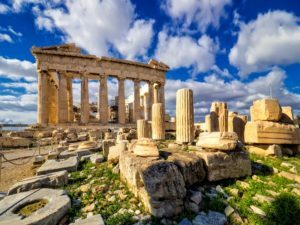 Today we enjoy a sightseeing tour of Athens City where we visit the world-renowned Acropolis,the ruins of the Parthenon, Erechteum and Propylea. Then, we ascend Mars Hill, where Paul preached and view the Agora (ancient market place, and former center of Athenian public life), the House of Parliament, the Tomb of the Unknown Soldier and the Presidential Palace. This afternoon is at your leisure to explore Athens on your own. Dinner and overnight in Athens. This morning we board our cruise and sail to the quaint isle of Mykonos, called the island of windmills. Here we experience the waterfront lined with shops and cafes and then stroll the charming walkways through a maze of whitewashed buildings before returning to the ship for dinner and evening entertainment. Docking in Turkey this morning, we enjoy a tour of Ephesus, one of the largest restorations still in progress with miles of ancient treasures. Ephesus was once a thriving port town of 250,000 people. Today you can still see the spectacular excavations of the major streets in this ancient city including the Agora, the Odeon, the Library, the marble-paved main Street, the Baths, Trajan’s Fountain, the Residences of the Patricians, the Prytaneum, and Temple of Hadrian. 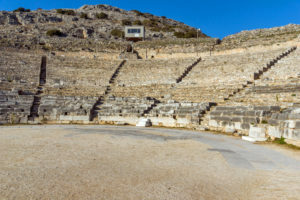 The Great Theatre, built in the 4th century B.C., could accommodate 24,000 spectators and is famous even today for its acoustics. 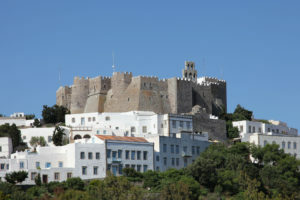 We then visit the Isle of Patmos, under statutory protection as a historic monument, where we tour the fortified monastery of St. John and the cave claimed to be where John received the Revelation. Back on the ship, enjoy dinner before settling in to your cabin for the night. Today we dock at Collosus, an island with a glorious history from ancient times to Medieval times as home of the Knights. we explore the Ancient Acropolis of Lindos and the port of St Paul, where Paul docked on the way back to Jerusalem. Dinner and overnight on Ship. This morning we dock at the legendary island of Crete, land of Minoan civilization and home of Zorbas the Greek! AN OPTIONAL shore excursion is available to visit the Minoan Palace of Knossos and where the Labyrinth and the Minotaur were located! 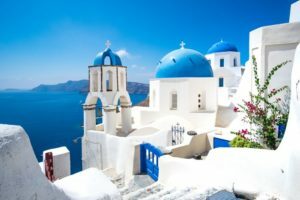 This afternoon we visit the volcano island of Santorini were you have time at leisure to explore this beautiful city on your own. Dinner and Overnight on Ship. Today we disembark from the ship and make our way to Corinth. It was in Corinth that St. Paul wrote First Thessalonians and also, most likely, his Epistle to the Romans. 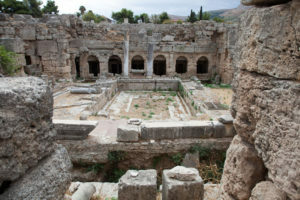 It was in Corinth that Paul encountered a multitude of problems in the congregation that seem to continue in today’s churches. We will visit the ruins of Corinth, where St. Paul worked with Aquila and Priscilla and see the first century shops, the Agora, Temple of Apollo and the Bema Seat. We make our way to Athens for our fare well dinner and overnight. We transfer today to the Athens airport for our flight home, taking with us wonderful and inspiring memories of our pilgrimage, which will be treasured and relived for the rest of our lives.